He was born in the village of Khil in Masalli region on the 8th of October, 1960. After finishing secondary school of Khil village in 1978, he started working on a state farm. Elshad was called for military service in 1979. He served in Batumi. After being demobilized from the army in 1981, he was hired as a police officer in the Department of Internal Affairs in Sabayil district of Baku city. Elshad Huseynov entered the Correspondence Department of Special Police School in Baku after N. Rzayev (nowadays Police Academy) and in 1986, he graduated from it in 1989. Elshad could not bear the aggressive behavior of Armenians against our nation. Thus, he applied many times to the Ministry of Internal Affairs and asked to be sent to the front line. Starting from 1991 he had regularly visited many combat zones. His first battle took place in the areas of Fizuli and Tartar. He passed this battle tests successfully. Elshad then fought bravely in the liberation of the villages such as Maraga, Chuvarli, Margushevan, Agbulag, etc. The courage that he showed in the battles made the enemy panic. 1992… and June the 15th … the fighters were ordered to release Ferrukh Village from the enemy occupation. The police knights were advancing towards the village. Elshad as always was fighting fiercely. He was morally supporting his fellow soldiers and his bravery was inspiring other soldiers as well. Unfortunately, when Elshad was changing his position from one trench to another he was shot by an enemy bullet. The life of the brave soldier ended. He was married and he is survived by three daughters. 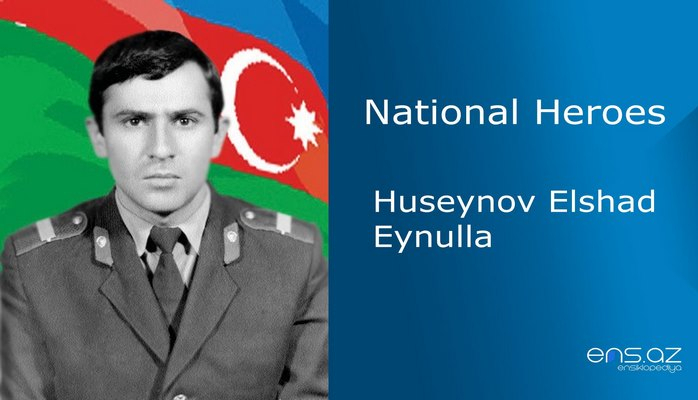 Huseynov Elshad was posthumously awarded the title of ‘National Hero of Azerbaijan” by the decree # 264 of the president of the Azerbaijani Republic on the 8th of October, 1992. He was buried in the village of Khil in Masalli region. There is a street named after him in Masalli and a bust of his is put in the village of Khil as well.